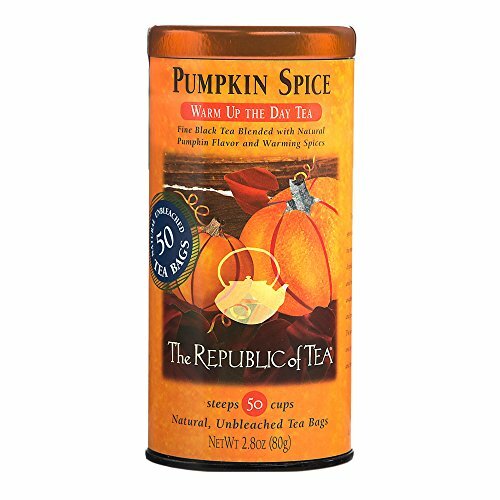 The Republic of Tea's Pumpkin Spice Black Tea is quickly becoming a favorite blend among pumpkin spice fans! Blended with the traditional flavors of pumpkin pie: cinnamon, ginger, nutmeg and cloves lends this fall tea a spicy aroma that is perfect for a crisp, fall day. Simply add a splash of milk to this aromatic tea, and it instantly turns into pumpkin pie in a cup! Featured in The Gourmet Retailer's Fall Gift Guide, this is a "must try" for a pumpkin spice latte alternative. Brew up a pot for your next pumpkin carving party or as Thanksgiving dinner treat. To brew pumpkin spice tea, simply heat fresh, filtered water to a rolling boil. Then pour water over tea and steep for 3-5 minutes. Seasonal Blend: The blend of fresh pumpkin with cinnamon, cloves, ginger, nutmeg and allspice make this tea a favorite. Fan Favorite: One of the most popular flavored black teas. Dessert in a Cup: Add a splash of milk for a taste that is reminiscent of pumpkin pie. Premium Blend: High quality black tea leaves are handpicked from China to form this aromatic seasonal blend. Health Benefits: Sugar-Free, Calorie-Free, Gluten-Free Tea.